A typical transponder broadcasts vehicle type and make, speed, braking, acceleration, indicators etc. Requests will be common for both live and historical movement and location data - from law enforcement, lawyers in civil disputes, general traffic management etc. Privacy law currently relies on notice and consent (difficult for vehicles) and in any case provides huge exceptions for law enforcement, emergencies etc. Often called ‘The Trolley Problem’ - where an accident resulting in a fatality is unavoidable, how do you decide who should die? Self-driving cars must prioritise human life over property and animals. Self-driving cars must not discriminate based on age, gender, race, disability, or any other observable factors. Owners may be pressured to accept some liability (e.g. in contracts). There are protections against unfair contract terms in the UK. 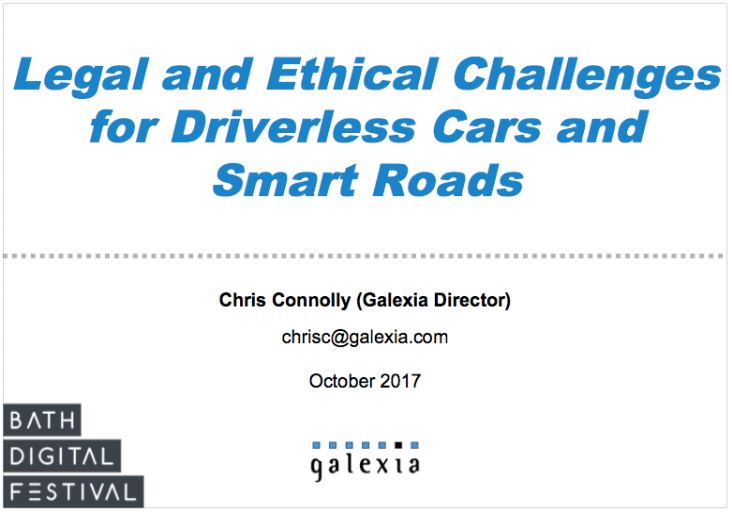 This will be challenging if algorithms for driverless cars are developed in just a handful of jurisdictions, or if AI is based on data initially obtained from just one culture. Recent developments in AI have demonstrated an ability for AI to develop new knowledge itself, raising questions about ‘who is really in charge’.